Easy Thai red curry shrimp recipe prepared with coconut milk. This curry is bursting with flavors and comes together super quickly. Perfect weeknight dinner idea! I think so the first time I tried a Thai shrimp curry it was either a yellow or red paste shrimp curry and I just remember I instantly fell in love with the flavors and aroma. This is one of my favorite Thai dishes together with the Tom Kha Gai and the Shrimp or Chicken Pad Thai. What is Thai red curry paste? In Thailand, curry pastes are considered super important. Pastes are prepared from scratch, by pounding fresh ingredients and spices to a smooth paste. The Thai red curry paste is just one variation. Other popular Thai curry pastes are the yellow curry paste, green curry paste, and the massaman Curry paste. Various ingredients including Galangal, shrimp paste, shallots, kaffir lime rind and chilis (to just name a few) make an aromatic Thai red curry paste. This particular Thai red curry shrimp is not an authentic or traditional recipe. It’s a quickly prepared version which I love to prepare whenever I’m hungry but in a hurry. 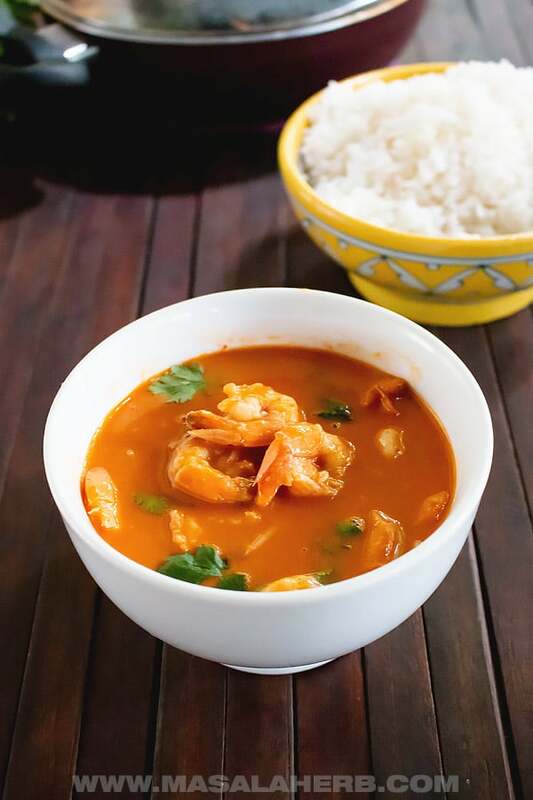 The shrimp curry includes some common ingredients to make it easy for you. I always get fresh medium sized shrimps for this Thai red curry and I bet you would prefer those ones too. The packet frozen shrimps are totally tasteless and your curry will lack flavors if you use those packet ones without tails. 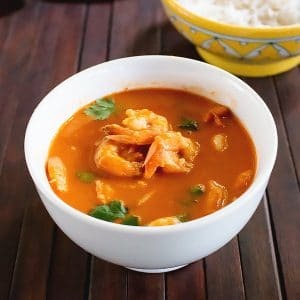 A pro tip to add amazing shrimp flavors to your curry is to add the clean shrimp heads to your curry while it’s cooking. The curry will turn out totally amazing and you just need to fish out the shrimp heads before you serve the curry. For the Curry Paste, I usually end up using a ready-made paste because I don’t always get all the ingredients for a proper authentic homemade red curry paste. In that case, I buy the Thai brand red curry paste. Yet, over the past years, I have been trying to recreate a curry paste, it’ s still in the testing phase. I hope to share an amazing homemade red curry paste in the near future. If you can, try to use homemade coconut milk for the most authentic and purest flavor experience. However, feel free to just use canned coconut which is widely available. I always use the Thai brand coconut milk (if I’m totally out of time) because of other brands kind of taste artificial and sometimes even sweet for some weird reason. Other taste-giving ingredients are the fish sauce, ginger garlic paste, brown sugar, lime juice, and cilantro. All the ingredients together balance the whole dish really well and I wouldn’t suggest skipping any of these ingredients. The fish sauce adds effortlessly amazing seafood flavors. The ginger and garlic bridge all the ingredients and help to thicken the curry further. 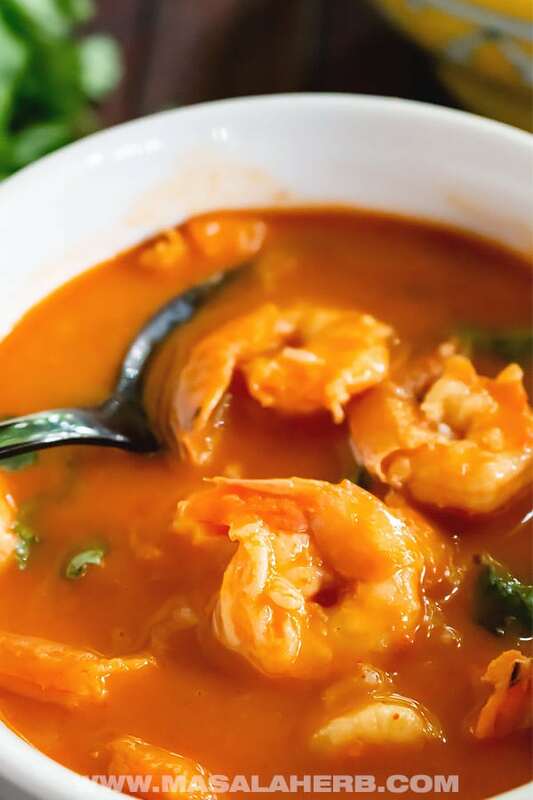 The brown sugar adds a sweet touch because you will add some lime juice for a sour touch and together your shrimp curry will have a wonderfully balanced sweet, sour, spiced touch. 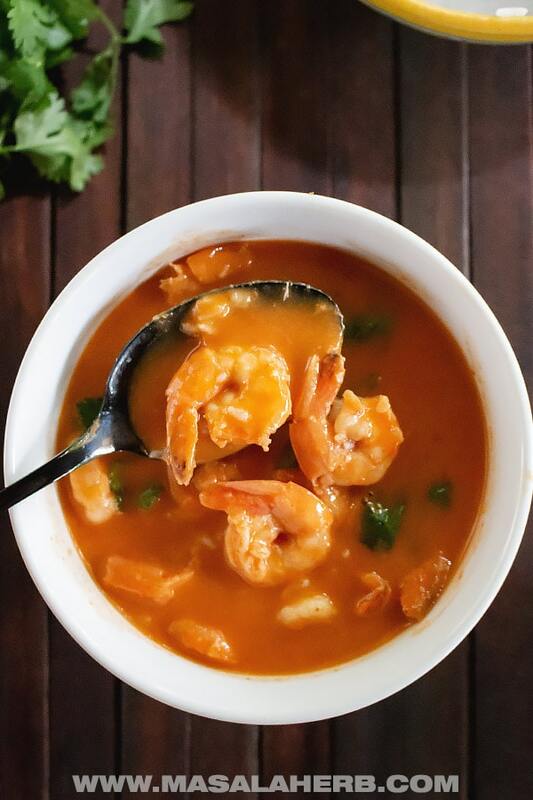 How to make red Thai curry shrimp with coconut milk? To prepare this Thai coconut shrimp curry, I recommend that you use an Asian shallow pan or a shallow braiser like the one from Creuset. I tend to use non-stick BPA-free pans because, well I’m trying to avoid that my curry gets burned and poisoned and at the same time. Also, I always use a bamboo spatula so that I don’t scratch my non-stick pans. You can also use a stainless steel shallow pan/wok. 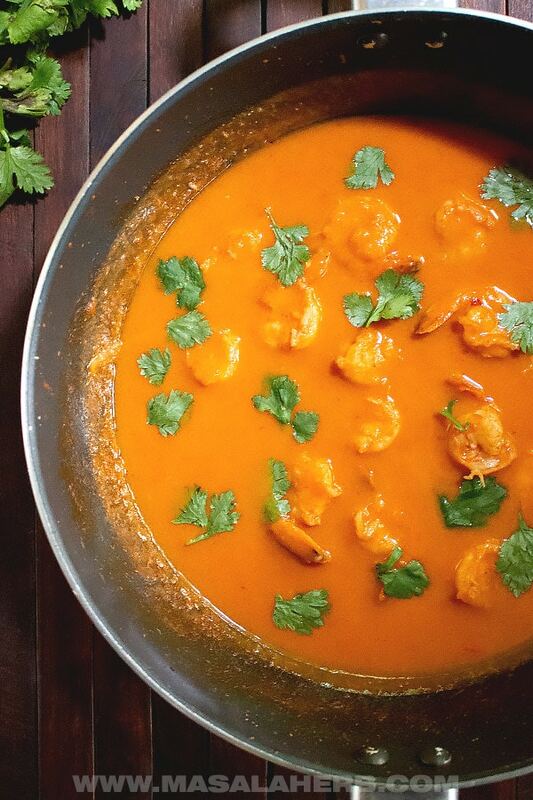 A flavorful Thai red curry shrimp with coconut milk! This recipe comes together quickly within 20 minutes, making it a suitable busy weeknight dinner meal. The one-pan shrimp curry is Gluten-free and Low-Carb. Heat up a shallow pan with oil. Add the ginger & garlic including the Thai red curry paste and stir-fry so that the aroma is released free with the heating process. Next, add the cleaned shrimps and stir fry as well so that all the shrimps are covered with the paste. Cook the shrimp for a minute or two on all sides. Then pour in the coconut milk and mix the content. Season the curry shrimp with the brown sugar and fish sauce and stir the content well. Allow the curry to cook for about 7 minutes or until the shrimps are ready and the curry has increased in flavor. Reduce the heat or take from the heat and pour in the lime juice. Mix well and garnish with fresh cilantro. Serve hot over jasmine rice. Dear Reader, how are you planning to serve and enjoy this Thai red curry shrimp meal?